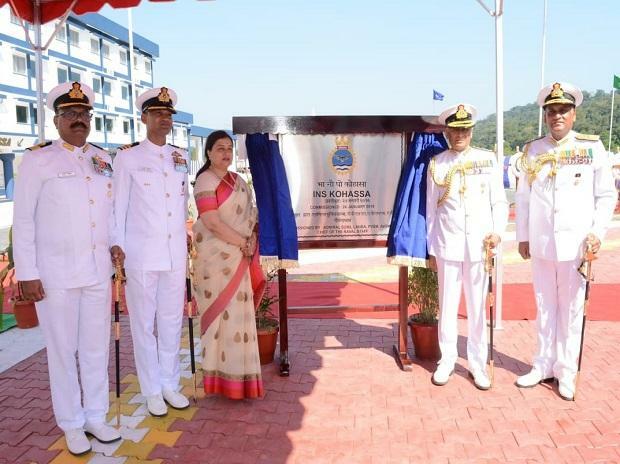 India’s military presence in the Indian Ocean got a long-delayed boost on Thursday with the commissioning of a full-fledged naval base, Indian Naval Ship (INS) Kohassa, in the North Andaman Island. The base, commissioned by navy chief Admiral Sunil Lanba, is the fourth military airfield in the Andaman & Nicobar archipelago (the Andamans). The 572-island archipelago dominates the Malacca Strait that links the Indian Ocean with the South China Sea. The Andamans also straddle the vital Indian Ocean sea-lanes, through which 100,000 merchant vessels carry $3 trillion worth of cargo each year, including much of China’s oil supplies and trade. INS Kohassa, which was established in 2001 as Naval Air Station (NAS) Shibpur, permitted short-range maritime reconnaissance (SRMR) aircraft such as the Dornier-228 to monitor the northern Bay of Bengal, where India shares maritime borders with Bangladesh and Myanmar. Many Indian aircraft, which participated in the abortive search for the missing Malaysian Airlines Flight 370, operated from NAS Shibpur. There are plans to expand the current 3,000 feet-long airfield to allow the navy’s long range maritime reconnaissance (LRMR) aircraft, the Boeing P-8I Poseidon, which currently operates from Arakkonam, Tamil Nadu, to stage through INS Kohassa. Being able to refuel and rearm at Kohassa, instead of doing the three-hour round trip to Arakkonam, would greatly increase the P-8I’s persistence over these waters. Expanding the airfield to 10,000 feet would also allow wide-bodied airliners to carry out commercial operations from INS Kohassa, facilitating tourism in the Andamans. “NAS Shibpur was identified by NITI Aayog as one of the ‘Early Bird’ projects as part of holistic island development. Towards this, [the navy] has been ready in all respects to facilitate civil flight operations from NAS Shibpur. The runway extension to 10,000 ft is also planned in the near future to facilitate operations of wide-bodied aircraft,” stated the navy on Thursday. The other airfields in the Andamans include INS Utkrosh in the union territory’s capital, Port Blair. This is a 10,000 feet-long runway, but a hill at one side makes commercial operations tricky, especially in windy conditions. There is also the Indian Air Force (IAF) base of Car Nicobar, at the centre of the 750-km-long Andaman chain. No fighter aircraft is permanently stationed at Car Nicobar, but the IAF rotates fighters on detachment through the airbase. Finally, there is INS Baaz, located in Campbell Bay, the southernmost island in the Andamans, which also happens to be the southernmost tip of India — even further south than Kanyakumari. This is the navy’s most forward located base, sitting less than a hundred nautical miles from the Strait of Malacca. The navy has long pushed for extending the 3,000-feet strip at INS Baaz into a 10,000-feet runway that could allow fighters to be over the Malacca Strait in minutes. However, the development has been delayed by land acquisition issues and inter-ministerial wrangling with the ministries of home affairs and environment. Meanwhile, causing heartburn in the navy, Prime Minister Narendra Modi and Indonesia’s President Joko Widodo on May 30 announced in Jakarta that India would help Indonesia develop the port of Sabang, less than a hundred nautical miles from Campbell Bay. “Instead of focusing attention and resources on developing an Indonesian port, New Delhi would do well to devote attention to upgrading INS Baaz, which is urgently needed,” says former navy chief, Admiral Arun Prakash. Relations with Indonesia have not always been smooth. In the 1950s, Indonesian president Sukarno had claimed the Andamans, and offered to support Pakistan in the 1965 war by opening a naval front against India. New Delhi’s relations with Jakarta are now much closer. Since 2002, the two navies jointly carry out an annual India-Indonesia “Coordinated Patrol” (CORPAT) in the Andaman Sea. Similarly, relations with Myanmar are now much friendlier. At the turn of the century, there were reports that Yangon had permitted China to open a radar monitoring station on the Coco Islands, barely 70 nautical miles from NAS Shibpur. However, then chief of the Andaman & Nicobar Command, Admiral Arun Prakash, recounts that in 2001, Yangon took Indian navy officers on a Myanmar navy vessel to the Coco Islands and demonstrated that these fears were misplaced. “The Andamans are strategic territory for India. We need at least three full-length, 10,000-feet airfields here, not just for military use but to serve multiple objectives of security, development and tourism to earn revenue,” says Vice Admiral Anup Singh (Retired), former chief of the Visakhapatnam-based Eastern Naval Command.